Below is the report from Colin Plant on our night at Hexton Chalk Pit last Tuesday night. It was great to record two new species for me, namely Hedge Rustic and Mompha sturnipennella (Which looks good for that species but will need to be dissected). REPORT: 29th August 2017: Hexton Chalk Pit N. R., Herts. Our impromptu trip to the Herts & Middx Wildlife Trust’s nature reserve at Hexton Chalk Pit last Tuesday aimed to plug a 9-week time gap in the moth records for the site. Unfortunately, and in spite of the warm and humid day, the weather chose to “break” that evening. Ben set out 4 lights and I set out two, one being the vertical sheet, but almost immediately the wind picked up. Within an hour, said sheet was billowing like the topsail of a fully rigged Man o’ War and moths were having difficulties getting to the lights! We struggled on to the witching hour, but as midnight approached we decided it was no longer worth the effort and we packed up. However, we did tick off a couple of goodies. We already knew that Agonopterix pallorella was present here, so it was good to see this Nationally Scarce species of chalk grassland again, but the big surprise was good numbers of Hedge Rustic – Tholera cespitis (including females that have laid hundreds of eggs). This is another Nationally Scarce species, but it is also one of those that has drastically declined in the last 50 years. 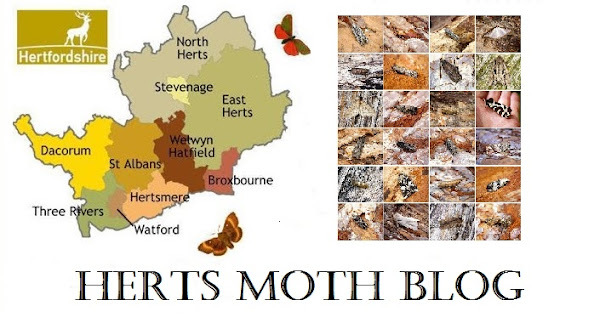 It used to be widespread and numerous in Herts, but more or less vanished in the 1990s before reappearing in the period 2008 – 2016 with sparse reports of low numbers (interestingly, mostly in chalk-based habitats). In many parts of the south-east we were worried that Hedge Rustic might be on the way out, but the Hexton moths probably support the alternative idea that it is just at the lowest point in its natural, cyclical population. We also caught a probable Mompha sturnipennella, another noteworthy species (it is associated with Rosebay Willow-herb), but in the interests of accuracy, until we have confirmed this ID by dissection I have left it off the list. The full list is below. Many thanks to the Herts & Middx Wildlife Trust for their continuing support for recording moths on their properties. 1462 Pempeliella dilutella ([Denis & Schiffermüller], 1775) *not yet dissected – so possibly “inscriptella”.